President Bashar al-Assad said that the Israeli aggression on a scientific research center in Jamraya in Damascus countryside reveals Israel’s role, in collaboration with the hostile foreign powers and their tools in Syria, to destabilize and weaken Syria so as to force it to give up its national and Pan-Arab stances and principles . Receiving Secretary of Iran’s Supreme National Security Council, Saeed Jalili on Sunday, President al-Assad stressed that Syria is capable of confronting current challenges and repelling any aggression targeting the Syrian people and their historic and cultural role, thanks to the awareness of the Syrians, the might of the Syrian army and Syria’s adherence to the path of resistance. Jalili expressed trust in the wisdom of the Syrian leadership in dealing with the aggression that targets Syria’s pioneering role, stressing Iran’s full support to the Syrian people in confronting the Zionist entity and its keenness on continuing coordination with Syria for confronting external conspiracies and schemes that aim to destabilize the region. Jalili conveyed Iran’s appreciation for the political solution plan for solving the crisis announced by President al-Assad and the Syrian government’s steps to implement it, reiterating Tehran’s readiness to offer all help needed for making the national dialogue a success as it is the only way out of the crisis. The two sides also discussed the outstanding cooperation relations between Syria and Iran and the two leaderships’ mutual keenness on further enhancing them in all fields. The meeting discussed the situation in the region in general and Syria in particular, especially in the aftermath of the blatant Israeli aggression on Jamraya scientific center in Damascus Countryside. 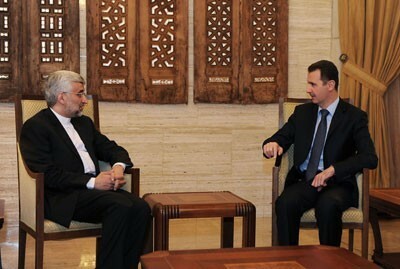 In a relevant context, Foreign and Expatriates Minister, Walid al-Moallem held a meeting with Jalili, in which al-Moallem stressed that the Israeli aggression on Syria proves its direct complicity with the armed terrorist groups to destroy the infrastructure and sabotage development centers in Syria. He added that the consistency of roles between Israel and these terrorist groups stresses Israel’s hostility and violation of the rules of the international law. In turn, Jalili condemned the Israeli raid on Syria, considering it as a proof on Israel’s aggressive nature and its being a threat to the security and stability in the region. Deputy Foreign and Expatriates Minister Fayssal Mikdad, Assistant Foreign and Expatriates Minister, Ahmad Arnous, Director of Asia Department at the Ministry , the Iranian Ambassador in Damascus and the delegation accompanying Jalili attended the meeting. This entry was posted in Uncategorized and tagged destabilize, Israel, Syria, weaken on February 23, 2013 by kruitvat.